Recently, I shared Etisalat Bblite Unlimited Browsing, Subscription Code and Psiphon Setting, some of my blog readers complain that it did not work for them, while some some is very slow. Today, I have come with new settings and to show you another way sto enjoy Etisalat Unlimited free browsing with just a token. 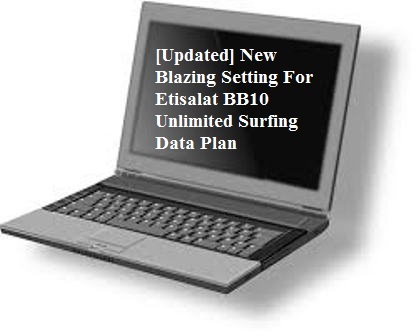 This new plan is called “Etisalat BB10 Unlimited”. Let hit to the game straight, no waste of time, before Etisalat will block it. Just follow the instruction below to keep flexing with your Etisalat BB10 unlimted surfing. » Change only the Proxy Server to: http://blackberryid.com. Forces close your Sypon Shield or Psiphon Handler and restart again. If you don’t have Sypon Shield or Psiphon Handler already, just click here to download Sypon Shield or Psiphon Handler now. Now, instead of activating the data plan with etisalat Bb10 Lite, use Etisalat Bb10 Mid subscription code rather. Etisalat BB10 MID is also part of Etisalat BB10 data plan, currently working like Etisalat BB10 Lite on Android devices which can also be tethering to PC. It is working flawlessly with the above APN setting and the aforementioned Proxy Server. If you don’t know how to tether your PC to work with your Phone, please click here to learn now. Hurray!!! Start surfing and enjoy your usual unlimited downloading!